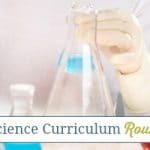 Science classes, particularly lab classes, are one of the reasons some parents choose to enroll their secondary students in traditional classroom schools. We can become intimidated by secondary science because we remember lab tables with black tops and stories of chemistry experiments going awry with smoke and flames. I taught three high schoolers the secondary sciences – biology, chemistry, and physics – and lived to tell about it. 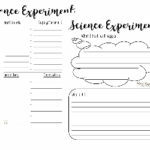 I learned while trying to muddle through a standard high school science textbook that lab science is experimenting, or playing around, with stuff to find out what happens. Science is something students do. can be found around the house or can be easily purchased. Physics is the study of the physical universe; laws that keep the planets moving, people from falling from the earth, and machines in motion. However, an in-depth study of physics is math dependent. However, for most of our students, an overview is fine. Here’s what is needed, many of which you can find around the house or garage. We found some of our best physic projects in older Boy Scout Handbooks. Electricity and electronic project kits, often found in toy sections, are also great resources. Biology is about life; life of all kinds. Life is everywhere and we can study this life from home. It’s a little different than the other two sciences. It doesn’t require a lot of equipment: some dyes (food dye generally works), a microscope, and maybe dissection material. Let’s look at what’s around our homes for biology labs. Outdoor labs – No matter where we live there are plants, birds, bugs, and other living things we can observe. Set aside an area of the backyard for no maintenance, no human intervention. Then, watch what grows and lives there. Take time to examine the soil to identify insects and soil composition. Ponds – Not those fancy fish ponds with plastic liners. I mean a pond like might be found out in the woods. Even on a small lot in the city, a pond is possible. We took advantage of a dripping faucet. Our little pond was about one foot in diameter and six inches deep. The dripping faucet kept the water fresh and mosquitoes at bay. We had birds, lizards, butterflies and bees all come visit now and then. We examined the pond water with our microscope. Dissection – The first question is often “Do I have to do dissection?” No. Court rulings have stated students cannot be forced to dissect an animal. Besides, many of us can only remember the horrible smell. Computer programs, coloring books, and websites will teach the same thing without the mess. Garden – The best way to study plants is by growing plants. Whether it’s a vegetable garden, flowers, or trees, students can learn about plant life by planting and maintaining. Gardens can even be grown indoors. 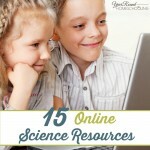 Our family used lab books and project books for our science program. It isn’t necessary to do every experiment in those books. I didn’t really want to do nuclear science at home. Most of the lab projects used the simple materials I’ve listed above. We had some textbooks to use for reference along with an encyclopedia. We also found supplement materials at the library. Encyclopedias and textbooks will help with general outlines of what is in each of the courses. Having a list of general topics helps us know if we’ve covered the basics. Remember, it isn’t necessary to cover everything in detail. Sometimes our students only need to be familiar with the topic. Also remember beyond secondary science labs, our students can also study the history of a topic, biographies of a scientist and science careers. For those of us who are raising a rocket scientist, what we’re able to teach at home may only be an introduction. Many community colleges allow high school students to take courses for high school credit. Some students start their college education with these advanced classes from community college. the various sciences rather than mastery. Teaching science in high school can be as easy as gathering the family together and learning about the world around us! 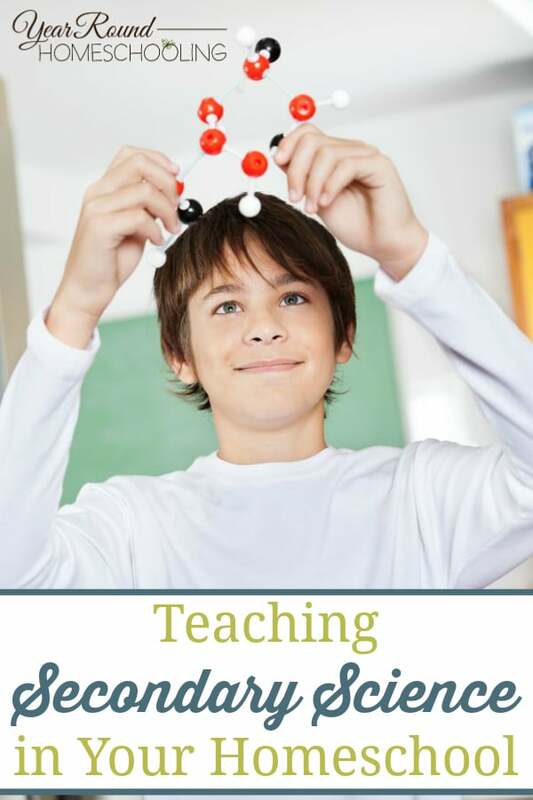 How do you teach secondary science in your homeschool? 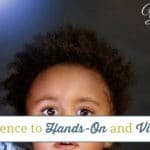 including Preschool: At What Cost?, Science in the Kitchen: Fearless Science at Home for All Ages, the award-winning Formatting e-Books for Writers and recently released Harried Homeschoolers Handbook.. Susan and her husband, Bob, began teaching their children at home in 1981 and are considered pioneers in the modern home education movement. The Stewarts live in Central Texas with their three dogs, three cats, nine chickens, and a donkey. They have three children and five grandchildren. You can read more of Susan’s practical solutions at www.practicalinspirations.com.